Squeee! 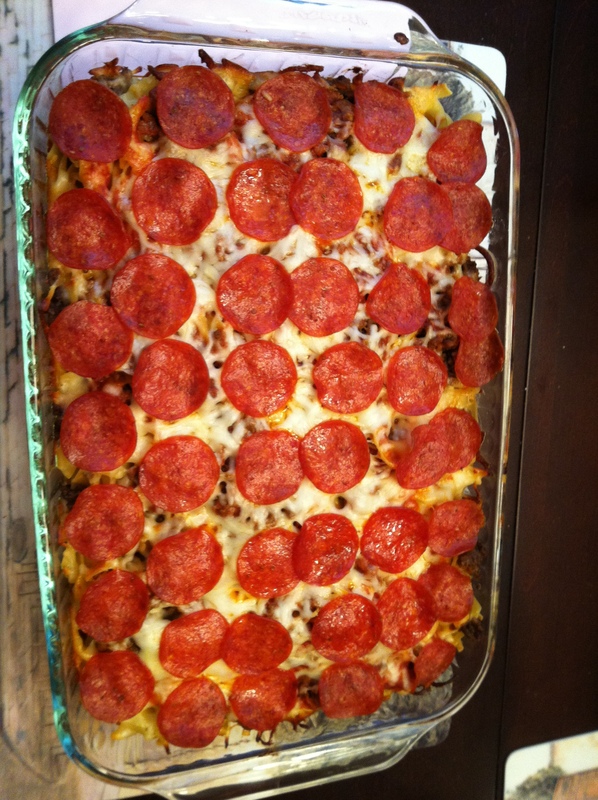 I did it – I finally made a Pinterest recipe 🙂 … Pizza Casserole …. Woo-hoo! And it ended up being absolutely DELICIOUS! For mamas is the original poster of this recipe and deserves amazing credit for such a great recipe! We LOVED it! Preheat the oven to 350. Boil the noodles per package instruction. Brown and drain the meat. Spread a thin layer of the sauce in the bottom of a 9×13″ pan. Add half of the noodles. Layer half of the meat. Half of the sauce. The remaining noodles. Half of the cheese. The remaining meat. The remaining sauce. And the remaining cheese. Add pepperonis to the top. Cover with foil and bake for 30 minutes. Remove foil and bake for another 15 minutes. Then let stand for 10-15 minutes. Personal Review: Oh my goodness, I cannot say enough good things about this recipe. It was so delicious and easy to make. Here’s a few tweaks I made to it: first while I was browning the meat I added some garlic powder and red pepper flakes. I considered putting in some fresh garlic, but my garlic press was dirty and so I just went with the powder. Diced onions would probably be good to add as well. You definitely need to add some spice to the meat so it has a little bit of a pop of flavor 🙂 To ease things, definitely start the noodles and don’t start browning the meat until you first put the noodles in – it will be timed better that way. Also definitely let it sit for 10-15 minutes after you take it out of the oven. It was kind of like a lasagna, and it needed to sit so that it doesn’t all fall apart when you eat it.